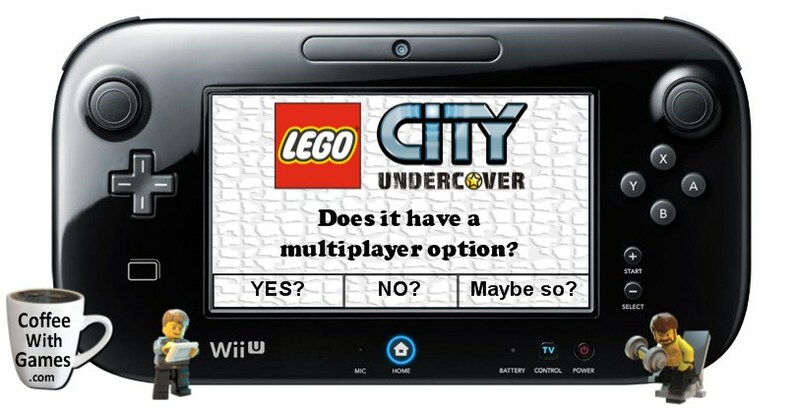 Coffee With Games: Nintendo says no, then yes, now no AGAIN on LEGO City: Undercover's multiplayer feature. Friday, September 21, 2012 - "The game is 1 player. No co-op/multiplayer of any kind." Monday, September 24, 2012 - "We are looking into this and will get back to you soon." Monday, September 24, 2012 - "Please refer to the fact sheet that states that there are 1-2 players." 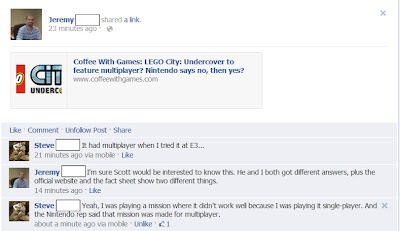 Thursday, September 27, 2012 - "We just double checked and I wanted to inform you that Lego City is in fact a 1-player game." Nintendo has now updated the LEGO City: Undercover "fact sheet" to show "Players: 1", instead of what it originally showed as, ""Players: 1-2". 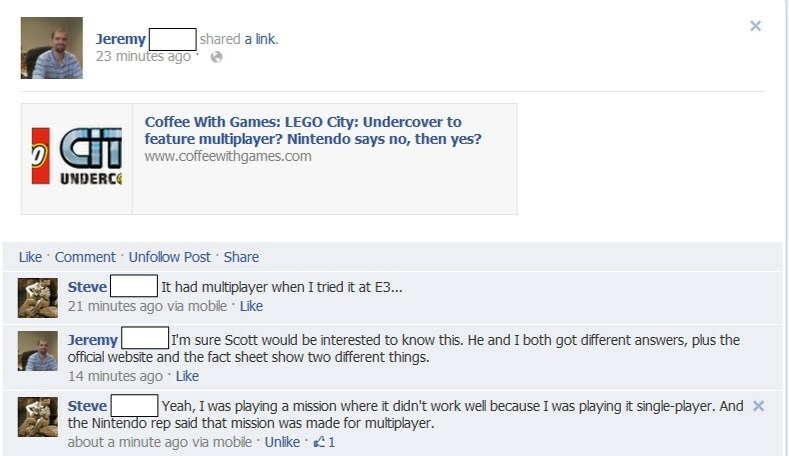 I contacted Steve directly on the issue of him having heard the game had multiplayer at E3 (that would have been in early June this year), and he said that is what he remembers hearing about LEGO City: Undercover from a representative while at E3. He even said he asked about online at the time, and they responded with a standard, "we cannot comment; nothing confirmed" type statement. If LEGO City: Undercover does release without some form of multiplayer, I think it will be the first home console LEGO game within the last few years without a local co-op mode in it at the very least. So, maybe in the early development and testing of the game, the multiplayer feature wasn't working well and TT Games and Nintendo decided to take it out? The original fact sheet on the game showing 1-2 players, along with Steve's recollection of what he heard at E3, makes me think this is probably the case for the game. Would you be more likely to buy LEGO City: Undercover if it had either a local co-op multiplayer option, or even an online multiplayer option of some sort? Can anybody think of a TT Games home console LEGO game, this generation, that doesn't have either a local co-op multiplayer option, or even an online co-op multiplayer option?